FBTBForums.net :: View topic - Battle Pack Alt. Models! FBTBForums.net Forum Index -> Contests and Community Builds! I bought yesterday my first battlepack ever! the droid battle pack is really fun, and it had some great parts for me. It didn't cost cheap, but I couldn't resist. 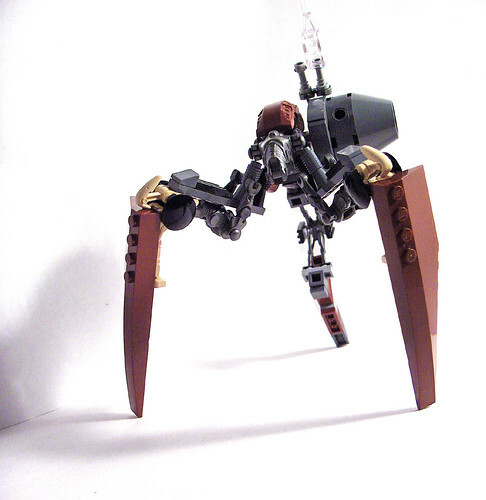 Here's an alternate I built out of it, excluding the two gray plates, and a couple of battledroid legs. Man your brain is amazing. You even make battlepacks look cooler. Jerk. Made of one Imperial Battlepack, a very limited build. )2eady? "A Royale with cheese"
Chew them out and spit them up. It's the way of the Nooblet. I saw that on the Flickr Outpost. 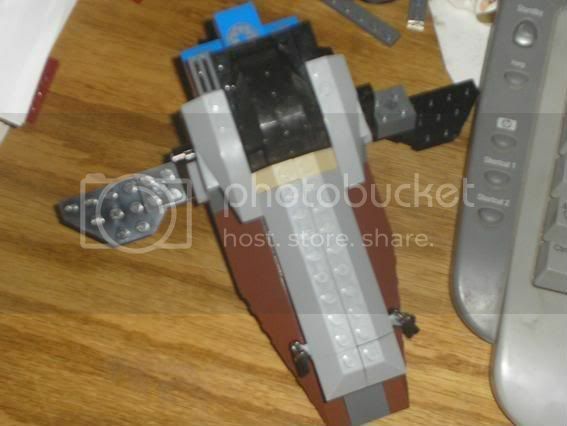 Impressive work with using the parts, and the ship looks pretty neat. Location: Trapped in my own thoughts. Wow! That's amazing! How many battlepacks does that take? Sometimes I wonder why I'm here. Location: Trapped inside a quadrilateral receptacle that is in front of you. This post was only a test. In the event of an actual emergency, the post would have been a lot more foolish. Scha-weet! That means that, given enough time and dedication, I could reproduce this awesomeness! Location: Dwelling in the darkness making goofy faces at everyone. It is truly awesome, makes me want to buy another droid BP just to do that. Awesome. I love what you did with the slopes on the right side. Built this out of one Battle droid, Imperial, and rebel battlepack. That looks pretty neat! I'll post mine later. I've gone through a bit of a Dark Age for quite a while, but I've managed to put together an alt model of the Imperial Dropship. Clicky for the thread in the MOCs section of the forum. I really like this idea. So here are a few models I've cooked up in the past couple of weeks. They all use 100% of the pieces from the Clone Battle Pack (7655) & none of the extras that are often in the box but not used by the instructions.
" -- Be Mindful, and Always remember -your focus determines your reality. 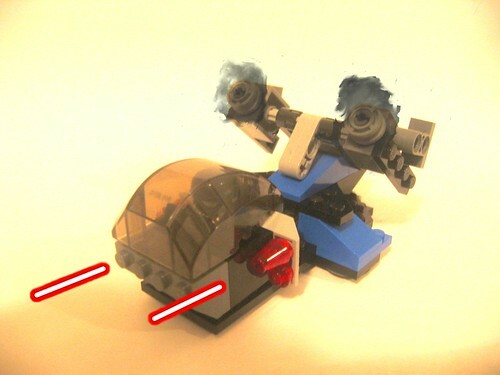 --"
Here's 5 alternate builds of the Droid Battle Pack. Only once could I figure out how to make use of any of the clear pieces. Some of these builds are "less stable" than I would like, but maybe they'll give someone else a starting place for their own MOC. If anyone is bothered by the size of these posts, please PM me. I only made them so large because I thought it would be neat to get these up before I left on vacation this weekend. Pretty nice work, overall. The best, in my opinion, are the Republic Self Propelled Gun, the Mine Sweeping Vehicle and the Confederate Anti Aircraft Gun. They have the smoothest and coolest designs the engines of the Republic gun and the wings wings of the mine speeder are particularly wicked. Nevertheless, the others aren't bad at all, either. By the way, really nice "targeting system" in the Multipurpose Quad Turret. Very neat detail, mesa likes. And I finally got in the game! Desperate to build something, yet with no LEGO spread across my floor, I opted to redesign an existing set. Voila! 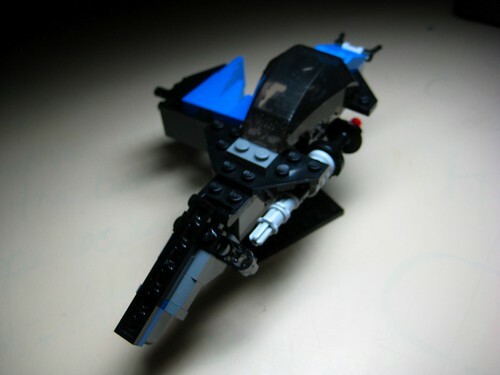 It's a speederbike, roughly based of my memory of a similar unit as the Trade Fed. Scout in Star Wars Galactic Battlegrounds. 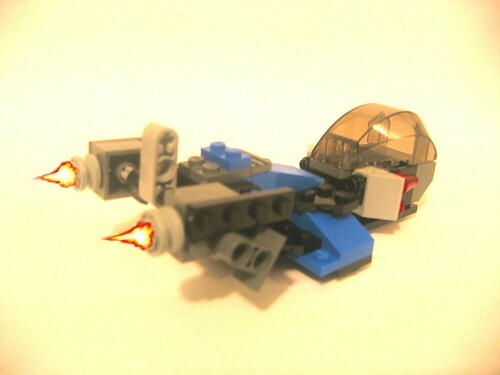 Comments welcomed, on Flickr, here, or the thread in SW MOCs that is the link. Sorry for the humongous BUMP. But I have a alternate model to share! Hmm, it looks like some of the links and images further back in the thread are broken. If anyone knows where they've been moved to (if they're still on the intertubes, that is), posting them here would be just dandy. Somebody set up us the bomb! Anything above is either a) Sarcastic or b) idiotic. at least my nose-hair is well groomed!